Our church family is diverse in age, in experience, and in denominational background as we strive to follow in the way of Jesus together in our lives, in our words, and in our deeds. Friends, no matter your background, you are welcome and loved here - just as you are. 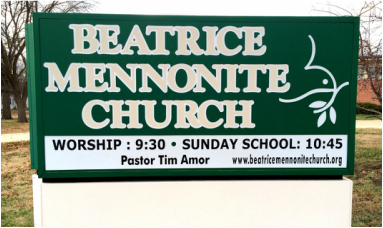 ​Beatrice Mennonite Church is located at 1220 Summit St, here in Beatrice, Nebraska. We meet for worship each Sunday morning at 9:30. Please join us! Pastor Tim Amor and his wife Jen moved to Beatrice in 2015 all the way from Buffalo, NY. Jen grew up in Buffalo while Tim is originally from the Toronto area of Canada. 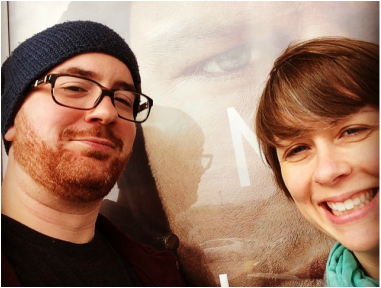 Tim and Jen enjoy playing board games, watching Netflix, cheering on the Buffalo Bills and the Toronto Blue Jays, and spending time with their cat, Agatha. dislikes: when the ice cream is all gone. Mennonites are Christians! Mennonites believe in the saving grace of Jesus Christ. Mennonites are Anabaptists, a Christian movement that believes we are called to follow Jesus's example in our lives, and to participate in Jesus's ministry of bringing peace and justice to our world. Mennonite congregations can be found around the globe! ​Mennonite World Conference is a worldwide community of Anabaptist churches.